Northgate at Heritage is a 55+ community in Deptford, New Jersey. This community has 400 beautiful single-family homes in a close-knit neighborhood where residents become fast friends. Surrounded by a lush, forested landscape, this community is as scenic as it is active, making it a beautiful place to call home. A well-equipped clubhouse brings neighbors together while its location off of Clements Bridge Road brings the Deptford Mall and all kinds of stores nearby. This active adult community has something for every kind of homebuyer in Gloucester County, NJ. At the center of this community is the 5,900 square-foot clubhouse. Residents can maintain a fitness regimen in the exercise room, while locker rooms are also available for your convenience. Social areas abound with a lounge, billiards room, and card room. Large community gatherings often take place in the ballroom and smaller groups can get together in the meeting room. Try your hand at a new hobby in the arts and crafts studio or discover a new favorite book in the library. The clubhouse also has a conference room, computer access, and a catering kitchen. There are plentiful ways to make the most of the warmer months with an outdoor pool and patio. Challenge a friend to a game on the tennis court, bocce ball court, or horseshoe pits. A putting green allows you to practice your short game before hitting the golf course. There are also walking and biking trails, allowing joggers to take a scenic stroll through the parks and natural space. Engel Homes developed this community between 2001 and 2012 with 400 homes upon completion. These homes range in size from approximately 1,448 to 2,385 square feet with two or three bedrooms, two to three bathrooms, and an attached two-car garage. Most of these homes boast front porches, fireplaces, dens, and large walk-in closets. A monthly homeowners' association fee takes care of lawn mowing, edging, two fertilizer applications per year, as well as snow and trash removal. There are plenty of ways to stay active while calling this age-restricted community home. Hobbyists will enjoy creating with arts and crafts activities. Socialize with neighbors around the billiards tables or a game of bocce ball. The putting green keeps your short game sharp without having to visit the golf course. Northgate at Heritage has several ways to stay as active as you'd like. 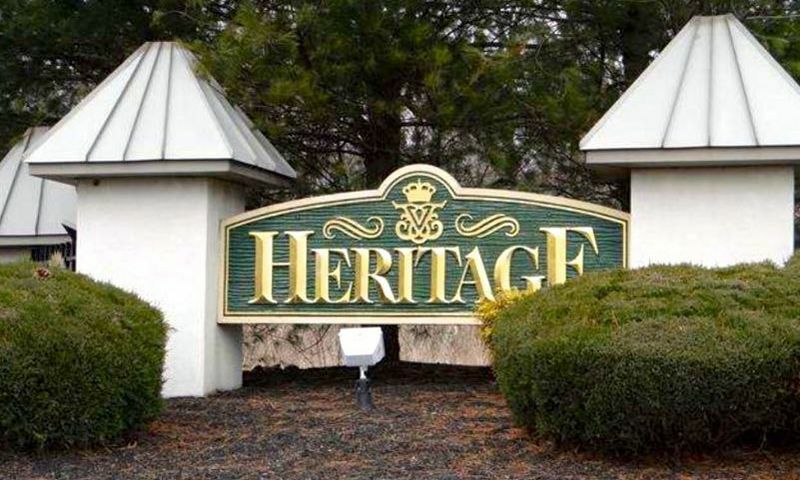 Northgate at Heritage is located in Deptford, New Jersey. Residents here are just steps from a wide variety of stores including a Sam's Club, Target, Lowe's, Walmart Supercenter, banks, and restaurants. For a more extensive shopping trip, Deptford Mall is just a mile away. Traveling around the region is a breeze with Interstate 295 a few minutes away. For farther travel, the Philadelphia International Airport is about 15 miles away. Homeowners in this community are never far from entertainment. Deptford is a suburb of Philadelphia and the city's world-class attractions are only 13 miles from this community. Water lovers will have the Delaware River nearby and golfers have RiverWinds Golf & Tennis Club and Westwood Country Club just a couple of minutes away. There is a movie theater also down the street for catching a matinee as well. Northgate at Heritage has everything that active adults could want or need in a 55+ community in Gloucester County, New Jersey. Clubhouse - 5,900 Sq. Ft. There are plenty of activities available in Northgate at Heritage. Here is a sample of some of the clubs, activities and classes offered here. Engel Homes developed Northgate at Heritage between 2001 and 2012 with 400 homes upon completion. These homes range in size from approximately 1,448 to 2,385 square feet with two or three bedrooms, two to three bathrooms, and an attached two-car garage. Most of these homes boast front porches, fireplaces, dens, and large walk-in closets. A monthly HOA fee takes care of lawn mowing, edging, two fertilizer applications per year, as well as snow and trash removal. Please Note: Floor plans are not available at this time. 55places.com is not affiliated with the developer(s) or homeowners association of Northgate at Heritage. The information you submit is distributed to a 55places.com Partner Agent, who is a licensed real estate agent. The information regarding Northgate at Heritage has not been verified or approved by the developer or homeowners association. Please verify all information prior to purchasing. 55places.com is not responsible for any errors regarding the information displayed on this website.